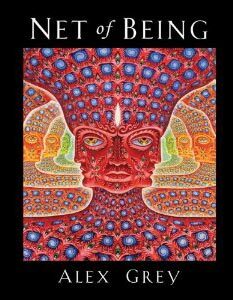 Within its opening pages, Net of Being showcases the wide range of media where a single painting of Alex Grey’s, Collective Vision (1995), has been featured. These include a magazine cover, a T-shirt, a music CD, Glowtronics slipmats on a pair of Technics 1200 turntables (with a glowing close-up, photographed under blacklight), event flyers, a 30’ x 60’ banner at a TOOL concert, the music video for the TOOL song “Parabola”, and a section within Sonic Vision’s “mind-blowing visuals” (with music mix by Moby) animated-in-the-round, which I was blown away by when I saw it on the domed ceiling of the Hayden Planetarium. 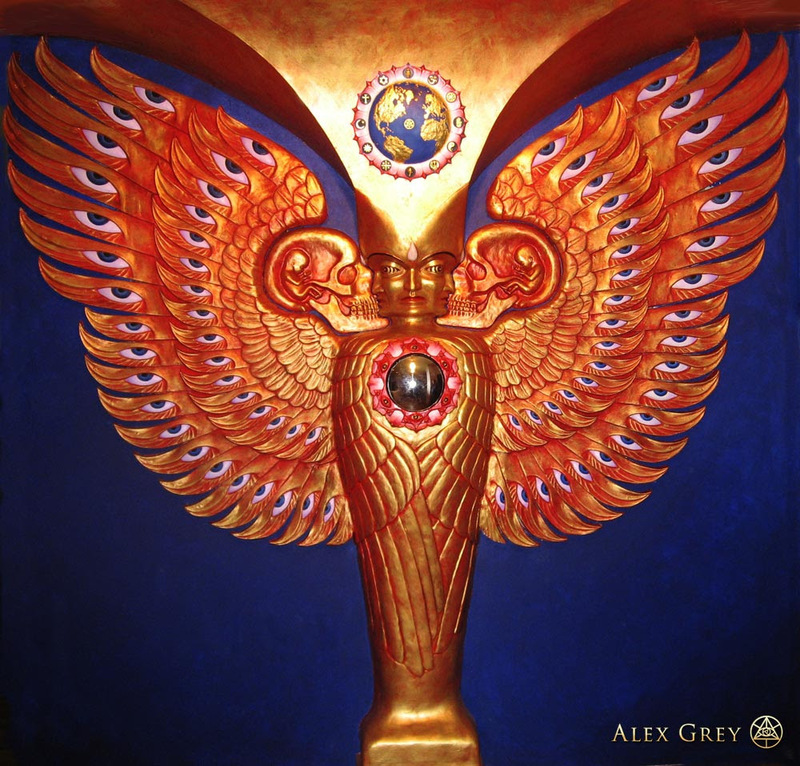 Other images from Alex’s collaborative efforts with TOOL are then featured, leading to pages with photos of over four-dozen tattoo versions of Grey-inspired flaming visionary eyes. One three-photo sequence depicts the painfully grisly dedication of a fan who created a simplified version of this flaming eye by cutting away pieces of skin: the first photo is blood-messy, the second wiped clean, and the third is the fan’s healed flesh with the symbol shown as a pink (eye) scar. After this, one finds a cover of The Watkins Review that announces its list of the 100 “most spiritually influential living people”; Alex’s art has been included within the 18 images depicted (alongside photos of the Dali Lama, Deepak Chopra, Oprah Winfrey, Ken Wilber, and others). Then there’s The New York Times article that covered the closing of the Chapel of Sacred Mirrors in Chelsea, followed by several images of Alex painting on stage at large music festivals. Finally, there’s a two-page spread featuring 96 photographs of Alex posing with assorted world-renowned artists, writers, activists, actors, musicians, chemists, spiritual leaders, friends, and a few folks who I did not immediately recognize. While the names of those depicted are unfortunately not included within the book, their identities can be discovered online. I was happy to spot my all-time favorite of this sort of photo, a beautiful black and white picture taken in 1975 at the opening of the Metropolitan Museum of Art’s Francis Bacon retrospective, where Bacon is animatedly engaging a bemused Andy Warhol, while Alex—sporting a calm, contemplative look that carries just the slightest hint of seeming practiced—appears to have snuck into the photograph a couple of steps behind the two famous artists. All that, before one even arrives at the book’s Table of Contents! Both of Alex’s previous art books included works dedicated to the topics of physical and spiritual love, depicting how such divine bonding can lead to the incarnation of new human forms. Net of Being continues these strong melodies, showcasing a bounty of recent paintings, such as Holy Family (2007), Holy Grail (2008), The Kiss (2008), One Taste (2009), Love Circuit (2008), and Love Is a Cosmic Force (2009), as well as older works, including portraits from the late 1980s of Alex and his soul mate Allyson. I was particularly pleased to see the delightful 1998 ink renderings of “Soultrons” (kin to artist Jim Woodring’s abstract symmetrical spiritual energies called “jiva’s”). I’ve had frequent visions of these little buggers, myself. Following the immediate community of one’s genetic family, Alex takes a step back to present vignettes from other life forms with which we share the planet. In his ink sketch Staring Down the Great Chain of Being (1981), Alex diagrams cosmogenesis. From the void, a universal expansion explodes; elements give way to illumination; self-propagating, it makes its own sauce; nucleic acids herald eukaryotic expression, multicellular environmental interactions shine a light on photosynthesis, ichthyologic iterations, amphibious amblings, replicating reptiles, ornithologic aeronautics, maximal mammalistic matings… With us as the ultimate upshot: it’s a wise man who recognizes a common source to all phenomena. Next up are sketches and paintings of flora and fauna—humming bird and horse, the metamorphosis of caterpillar to butterfly (all from 2005), Symbiosis and the Gall Wasp (2010), and the interconnected effects of humanity on habitat showcased in Person/Planet (2000) and Gaia (1989)—provide a clear ecological message that honors environmental diversity. But most often, the appeal of Grey’s art is due to its focus on the human experience: from birth to death, plus before and beyond. Bone and blood vessels, shown clearly, inherently contain a message of the fleeting temporality of our material existence. In one of the more touching points of the book, through poetry and paintings such as the aforementioned Gaia, as well as Grieving (2001) and Power to the Peaceful (2005), Alex addresses the tragedy of 9/11 and the possibility humanity has for transforming conflicts prior to their becoming wars. In a section titled “Remembering 9/11 Before it Happened”, Alex mentions several pieces of artwork that depict twin towers burning, including album covers by two different bands (The Coup, and Dream Theater) and a panel from within The Adventures of Superman #596. The book also reproduces Alex’s World Trade Center Visitor pass, with the expiration date 09/10/2001. I can only imagine the psychological impact of 9/11 for those who lived in New York City, much less for someone who might have visited the Twin Towers so soon before they fell. Several dear friends, all around my age, have died in the past few months. Most recently, my close friend Dawn passed from stomach cancer. We’d been blessed to enjoy her company for the last twenty-plus years, and she’d worked for me behind the scenes at nearly every one of my Mind States conferences. Just after 9/11 this year, her sister held a wake for Dawn’s; after which, she encouraged my wife and me to take any objects we wanted from Dawn’s house. Having never looked at her possessions through those eyes, I was struck by how different our tastes in art were and I realized that she didn’t have much that I would actually want. Just before we left, I happened across a copy of Alex’s book Transfigurations. I’d never noticed that Dawn owned this book, which is odd considering how few books she owned, how much I like books, and what a big book it is. Autographed by Alex—inscribed: “With love + appreciation! See you in hyperspace…”—I figured that Dawn must have gotten it at one of my conferences. Flipping through the volume confirmed my hunch, when I found a Mind States flyer used as a bookmark. Also pressed within the book’s pages was an original sketch (not by Alex) of Dawn and her then-four-year-old daughter on a beach in Cancun, dated three months before she learned she had cancer. Though the artistic merit of the sketch is mild, the woman depicted is smiling and relaxed. It made me happy to discover at least one place where our taste in art seemingly merged, and to know that her appreciation for art had been expressed so recently in her life during better times. Over the course of their artistic careers, Alex and Allyson have made pilgrimages to various sites featuring sacred art and architecture. Photographs in Net of Being evidence the Greys at: the Alhambra in Spain; the pyramids of Egypt and Mexico; the Sphinx; the Pantheon; Damanhur; a David Best Temple at Burning Man; the Bahai building in Chicago; Ernst Fuchs’s Nympheanum in Vienna; Florida’s Coral Castle; Cathédrale Notre-Dame de Chartres; the Aztec Calendar unearthed during repairs to the Mexico City Cathedral (holy art and architecture, Atman!) 160 years before the birthday of Dennis McKenna (don’t believe that misleading Mayan – McKenna mythos from Terence2012, yo! ); and numerous other spiritual sites. Via their external and internal travels, Alex and Allyson extol a post-denominational transubstantiation for trippers. Their participation in and artistic support of the worldwide festival culture, modern tribal gatherings, and Bicycle Day celebrations inspires us to dance to the synesthesic sounds of cosmic creativity like every One is watching. Grey’s enthusiasm for the beneficial effects that psychedelics and entheogens have had on his philosophical outlook and his connectedness to a spiritual source is a well-known current underlying his prose, poetry, and art. Explicitly, within Net of Being, entheogenica is represented via paintings such as Cannabacchus (2006), Mushroom Sutra (2007), Cannabis Sutra (2010), and his portraits of psychedelic pioneers: St. Albert and the LSD Revelation Revolution (2005-2006), The Shulgins and Their Alchemical Angels (2010), and Stanislav Grof, Cartographer of Consciousness (2011). However, given a few moments to allow the slumbering baby-brain in his viewers to awaken, we eventually realize that there are three more faces strongly implicit within each of the Being portraits: on the back side of the “between incarnations Being” is no hippie ponytail, but another face; and that face is looking directly into the incarnation behind the image, the artist behind the painting: the humble, sweet smile of Alex Grey, himself. The final face is, of course, your own now-mildly-more-enlightened mug: the viewer’s visage. And once you’ve grasped the smaller picture—four material meat puppets, each of which is a perfect fit for the energetic spiritual space present between incarnations—it’s a shorter step toward infinite expansion, whereupon the Being paintings seem somewhat symbolic: personalized portrayals of those networked nodes making up the individual fountains and drains of Light, interlocked, infinite, omnidirectional, composed of and circulating a brilliant iridescent love energy (to paraquote Alex); sparks from each incarnate, pass, and reincarnate. In other words, the Being paintings have simply put a sort of face onto Grey’s Universal Mind Lattice (1981). 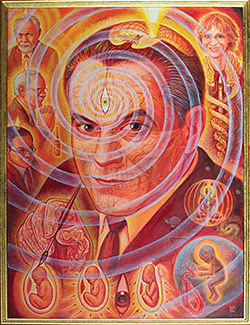 The first glimmerings of the “expanding head” shape—presented in the Being works—comprised of spiritual energy lines, which later developed into a basket-weave of divine flame—can be found in paintings like Spiritual Energy System (1981, Sacred Mirrors) the DMT-inspired Transfiguration (1993, Transfigurations), Original Face (1995, Transfigurations), and Glimpsing the Empyrean (1997), which I was pleased to see a nearly life-sized reproduction of in this book, as it previously had only appeared substantially smaller in Transfigurations. The expanding-head portion of the shape has taken a slightly different depiction in other works, where it is shown as a whirlwind of creative energy piercing the nirvana crown chakra of the artist or spiritual seeker, transferring inspiration from on high. 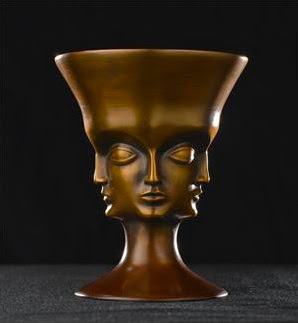 A four-faced Being may have first appeared within Alex’s art in a bronze sculpture World Soul (1991-1993). This early version was both angelic and demonic, featuring a body like the New Pheonix from the frontispiece of The Adventures of Simplicissimus and an omniscient expanding head covered with eyeballs. World Soul “portrays a four-faced hermaphroditic self-copulating dwarf with wings, claws, and a fish’s tail. 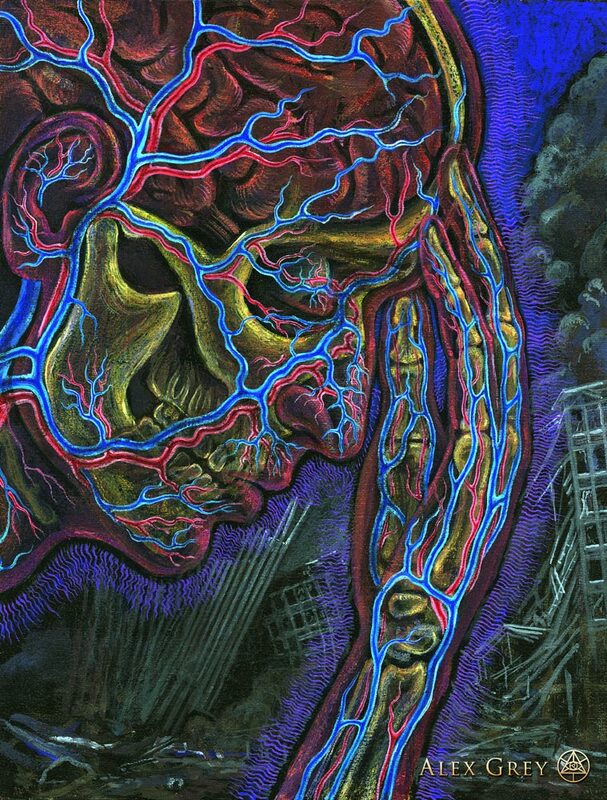 This divine mutant symbolically encompasses all realms of consciousness.” (Transfigurations, p. 140). Atop a peaceful male face to the left and a wrathful male face to the right, the front of the figure features a peaceful female face. And although the “wrathful” male face only looks slightly crazed (due to his wonky eyes and Terence McKennaesque beard), the wrathful woman’s face on the back of the sculpture appears much more angry/evil; indeed, the gaping hole from her carved-off nose, along with the context of her saggy breasts hanging over a bony rib cage, cause her face to look like a skull. Which makes the fact that she is gently holding a calm, Buddha-like baby to her bosom seem surprising (although it shouldn’t be, when one considers the repeating themes of contrasting dualities throughout Alex’s work). Next, a three- (or four-) faced Being makes an appearance as an energetic angelic imp, bringing a new soul to the fetus of a pregnant woman in The Promise (1997, Transfigurations). 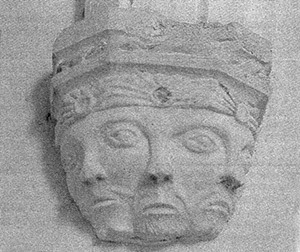 Other versions of three- and four-faced spiritual beings include the angelic archways flanking the Sacred Mirrors in a computer graphic animation fly-through artist’s conception of the Chapel of Sacred Mirrors that was executed by Jon Bell and Cody Harrington in 1999. 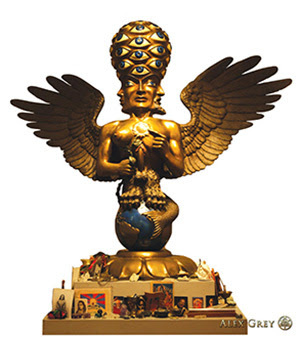 The CoSM Angel—a sculptural guardian from the entryway to the Chelsea district’s incarnation of the Chapel of Sacred Mirrors (2004-2009)—combines elements from the World Soul and the angelic archways with skull-fetuses from the Being paintings. Three-/four-faced Beings—composed of spiritual fire, cosmic connectedness, and divine sight—also appear on several of my favorite more recent paintings: Cosmic Elf (2003), Net of Being (2002-2007), and Godself (2012), as well as the sculptural pieces World Prayer Wheel (2005-2012), Soulbird (2010), and CoSM Grail (2012). The culmination of the Greys’ art, life philosophy, and dedication to sacred architecture is most directly expressed by the development of their New York-based Chapel projects—first in New York City, and later in Dutchess County—where they’ve held ritual gatherings coinciding with each full moon since 2003. Communion is not just for Christians and alien abductees, after all! And neither group is excluded from or by the entheocognoscenti or the massively mushrooming psychedelic scene. An enjoyable aspect of CoSM when it lived on the west side of Manhattan was its associated MicroCoSM Gallery, which showcased the works of other visionary artists. Net of Being contains a few pages of photos depicting the life of this gallery. I was psyched to see that Isaac Abrams was one of the artists who’d shown there. Further text and photographs tell the story of the Greys relocating CoSM to its permanent home: a “fixer upper” retreat center in Wappinger, New York, where they’ve done an inspiring amount of “fixing up”! 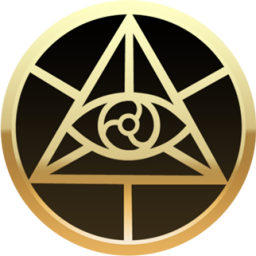 In 2008, CoSM officially became a government-approved religious organization, taking over from the Foundation for the Chapel of Sacred Mirrors, which became a registered non-profit organization in 1996. And while a target date for building the temple itself is set for 2020, it is hoped that the Entheon Exhibition Hall will open by the end of 2015. Entheon is being constructed as a remodel of an 1882 carriage house on the property. When my family visited a few years back, I recall the myriad practical considerations that had to be dealt with, including possible future danger posed by a large aging tree near the building, and the Greys’ plan to dig out the building’s foundation in order to provide higher ceilings. As a means to raise money needed for renovations, CoSM recently held a Kickstarter campaign. Their target was $125,000. For lovers of Alex’s work, numerous exceptionally cool “donation gifts” were offered, making this one of the most diverse and generous Kickstarter campaigns—from the point of view of the folks soliciting help—that I have ever seen. Grey fans clearly agreed with my assessment, as well as with a piece of advice given to the Greys by Alex Stark that was mentioned in Net of Being: “building sacred space [is] the task of a community.” With 1,510 backers donating $210,127, the Entheon campaign is currently the third “most funded” art project in Kickstarter’s history; not too shabby to raise almost twice what they were aiming for (and nearly a quarter-million dollars) in just over a month! 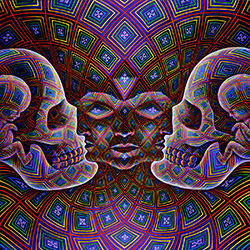 One can’t help but be impressed with Alex Grey’s voluminous output over the course of his career-to-date as chronicled within Net of Being. Not only does the book introduce many paintings completed during the eleven years since Alex’s last large-format art book was published, but it also contains numerous older pieces that weren’t featured in his earlier books. There is a degree of repetition—both textually and visually—within Sacred Mirrors (96 pages, 1990), Transfigurations (168 pages, 2001), and Net of Being (209 pages, 2012). This is understandable, as each book provides a more complete picture of the artist and his contributions, thereby standing on its own, independent of the other two volumes. Fans of Grey will undoubtedly appreciate the slight “refresher course” of this overlap in content, and Alex has done a wonderful job presenting similar visual material in a somewhat different format: paintings or drawings that were previously shown as small marginalia have now enlarged to fill a whole page, or vice versa. Although I heartily encourage purchasing all three of Alex’s art books for your library, if you can only afford one, it should be Net of Being. My only complaint about this series of books—a trifling and capricious grumble, to be sure—is that each lacks an image index. However, this oversight forces fans, scholars, and reviewers of Alex’s books to repeatedly leaf page-by-page through the tomes and enjoy them all over again, which in the end isn’t such a bad thing. In his recent book, The Psychedelic Future of the Mind , author Thomas Roberts argues that religion moved from being primarily ritual-based to being primarily word-based around the year 1500, due to the democratizing effect that the printing press had on access to religious “thought” and expression. Further, Roberts proposes that we are currently in the midst of another major shift of religious development. This time, we are moving from religion that is primarily defined within communication-based conceptual constraints (i.e., The Word) to a religion that is primarily defined by direct personal transcendent experiences. The latter has been made possible due to the democratizing effect of the increasingly widespread knowledge and availability of visionary plants and chemicals used for entheogenic purposes. 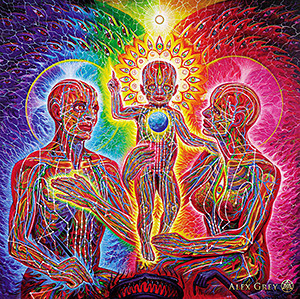 If this theory of moving from word-based religion to peak-experience-based religion is true, psychedelic aficionados are lucky to count Alex Grey amongst our champions. A picture paints a thousand words, after all.